I'll probably get flogged to death with wet acrylic boucle yarn but I'll say it anyways: Fall is just around the corner. Or, if you're a GoT fan then it's probably better to say Winter is Coming. I don't know if it's because the nights have started to get nippier (at least in my part of town), or if it's because I've been school supply shopping and slowly trying to get the Munchkin back into school mode but lately I've been thinking a lot about warm woollies and socks. Lots of socks. So when the opportunity to review the fall issue of Sockupied popped up, you bet I said "heck yeah, sign me up!!". Do you really think I would turn down the chance to look at, chat about, and most likely queue up a few sock patterns? Of course not! Bring on ALLLLL the socks! In case you're not familiar with Sockupied (and if the name doesn't give it away), it's an interactive e-magazine that focuses exclusively on nothing but socks! Each issue contains five or six sock patterns (all of which are also available in a printable PDF format via a simple click), sock related articles, tutorials, tips, videos, and galleries. I have several issues stored away on the Sockupied app on my tablet. I love the layouts, the ease in which I can quickly scan the magazine, and if I want to check out the pattern in its entirety I can with a simple tap. In this particular issue there are six brand new and beautiful sock patterns, a short interview with featured designer, Debbie O'Neill, and a really fascinating article about the sock history of the Russian Empire. Unfortunately for me I couldn't read the whole article as I received the PDF version of the eMag to review and can only assume that the rest of the article was one of the many interactive parts of this issue. Anyhoo, let's get to the real reason why we're here: the patterns. Like the majority of knitters out there, I determine whether or not if I'm going to buy a knitting magazine based off of how many patterns I like and would consider knitting. Sockupied Fall 2015 retails for $11.99 USD (which would be about $16-17 CDN, depending on how much crappier/better the exchange is) and if you divide that by the six patterns, that would make each pattern $2 USD each! That's such a steal! I would definitely knit three (four, if I had the guts to do colourwork on socks) of these patterns and so I would definitely add this issue to my shopping cart. But I'm not sure if this issue is for everyone. I did take note that this issue contains four top-down patterns, one toe-up, and one that has instructions for both construction methods. I could see this as being a potential "deal-breaker" for sock knitters who knit exclusively one way or the other as to whether they'd purchase this issue or not. I know there are a lot of knitters out there that are steadfast top-down/toe-up sock knitters and would therefore turn down any pattern that wasn't written for their preferred method. Some knitters like the challenge of converting a pattern to fit their style and some just want to knit the pattern as written. I'm pretty neutral on the subject and so it doesn't bother me either way, but for those of you who do have a strong preference, take note: Yay for top-down sock knitters, boo for toe-up. As for pattern difficulty, well, I'm not one to say whether or not if a fellow knitter can or cannot knit a particular design because in my opinion it's all about what the knitter can, or think they can, knit. With that said I think the majority of new sock knitters might find most of these patterns a bit intimidating. 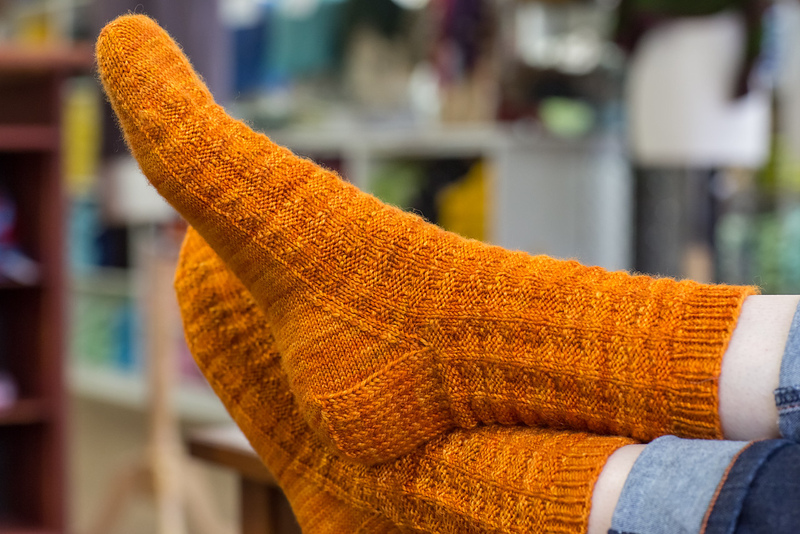 There is one pattern in the lot that is highlighted as being 'good for beginners', the Hominy Socks by Marie Godsey (pictured above), which I can agree with as the pattern is simple and uses straight up knit and purl stitches and basic decreases. My only problem with this pattern is that it's written in only one size. I think I'm experienced enough to know how to work around that but a newbie sock knitter might not even know where to begin. Or worse yet, knit the socks as written, have the finished sock not fit, the knitter blaming themselves for why the sock doesn't fit, and therefore might not want to knit another sock again. No! That thought makes me shudder!! I think it's odd that this pattern is written in only one size when all the other patterns contain at least three sizes, why not this one as well? Although the size given would be tight on my feet, I'd still knit this. One of my favourite socks in this issue is the cover pattern, the Electrostatic Lines Socks by Jennifer Raymond. These socks contain qualities that I love: a funky zig zag design, knee high, and the endless colour pairing possibilities...ooohh!! You just know I'm thinking hot pink and grey!! These socks are such eye-catchers and look like a lot of fun - both to wear and to knit. But like I said earlier, I don't know if I have the guts to try my hand at colourwork on socks just yet, but if I did I take solace in knowing that this pattern is knit toe-up and I can keep trying them on to figure out which charts I needed to use to fit my calves. I hope you don't take my lack of self-confidence in colourwork as any indication of the pattern's difficulty level because really, reading over the instructions, if you can knit a basic sock that fits you well and you know how to read a chart, then you can knit these socks. I just seem to freeze and doubt myself when it comes to floats in my knitting and my need to yank on the working yarn a lot. And then there's A Walk in the Woods Socks by featured designer, Debbie O'Neill. This design really caught my eye and piqued my interest. The cuff, the lace, the asymmetrical lace detail on the instep, and again the knee high length...all together makes for a gorgeous sock. The cuff, which is comprised of two different rib patterns, is so pretty and one that I have never seen before on a sock really intrigues me. And let's talk about the fact that the lace pattern mirror each other. Yes! Be still my heart! The pattern includes three sizes and each size has its own chart for both feet for the instep and leg. My only concern is that judging from the pattern the amount of stitches you cast on for the leg is only a couple of stitches more than that for the foot, and let me tell you, 68 stitches for my calf is definitely not enough. I don't think it would be too hard to fix that though. This sock is just so pretty that I'm willing to give it a go! Another one of my favourite patterns is the Sockupied exclusive, Gladys Thompson Socks by Kate Atherley (pictured above). This pattern was actually slated for her newest book, Custom Socks (which I am dying to get my hands on!! ), but was cut out due to lack of space. You won't be able to find the pattern for these beautiful socks anywhere else but in this issue! These gorgeous socks were inspired by classic Gansey stitch patterns and was named after the knitter/author/historian who first published the Guernsey and Jersey patterns. Best of all, the pattern includes instructions for both top-down and toe-up versions, which you can also see in the photo above!! So awesome. I really appreciate it when the designer and/or publication show that in their sample and photos. I absolutely love how textured and cozy these socks look. They just demand that you wear them all throughout winter...in front of the fireplace...whilst knitting away on an equally cozy sweater. I also love that this pattern comes in six sizes, with the largest being 24 cm (9.5") foot circumference. With a variety in sizes mixed with the neutral looking stitch patterns, this design could be knit up for men too. I also love the suggestion of knitting one sock top-down and the other toe-up to avoid knitting the same sock twice. Perfect for those who suffer from Second Sock Syndrome! The other two patterns in the issue are Riband Socks by Heidi Nick and Checkers by Mone Dräger (pictured above). Normally I'm all about the cables but for some reason the Riband Socks just aren't doing it for me. I'm not sure if it's because of the colour choices or because one of the pairs look ill-fitting in the samples shown, but I'm not really sold on this pattern. I think the cables are lost within the variegated colourway, and while the pink colour makes me giddy with joy, I can't get over how it looks a little...slouchy. As for Checkers, I think these socks are fun and cool looking but the construction of them just isn't my cup of tea. There's a lot going on here: you're knitting them in the round before you start knitting them flat, there's a lot of picking up of stitches, and of course, the stranded colourwork to keep mindful of for the front of the leg. As someone who likes to try their sock WIP on several times during the knitting process, I don't think you'd get a chance to try this design on until you're more than halfway through knitting the sock. If you're a very experienced sock knitter, or a process knitter, or even just a very confident knitter, I'm sure this pattern would be right up your alley. At the end of the issue there's a handy glossary for instructions on how to execute Jeny's Surprisingly Stretchy Bind Off, Judy's Magic Cast-On, Turkish Cast-on, the short-rows version and increases used in these patterns, and of course, the Kitchener Stitch. I don't know about you, but no matter how many times I've done the Kitchener Stitch, I still need to look it up on how to get it going. Every.single.time! 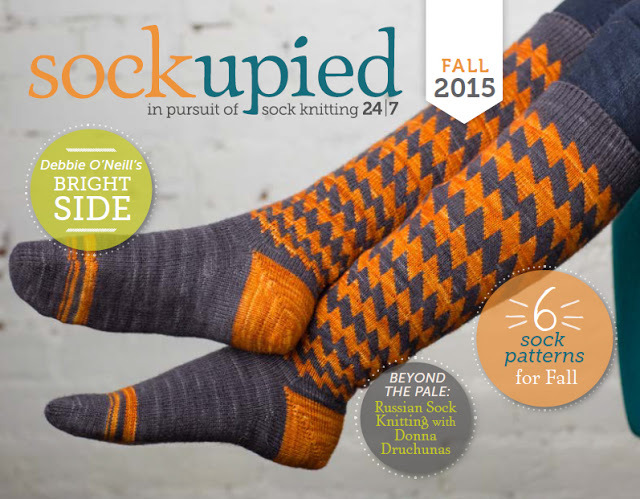 So, my overall thoughts on Sockupied Fall 2015: I totally dig it! I've already queued up a few of the patterns and am thinking of what I have in the stash to knit them in. I think if you're a sock knitter and/or are wanting to go beyond plain vanilla, it's definitely worth checking this issue out! Which of these socks do you like? Have you been thinking about socks lately too? Or do you never stop thinking about them? I for one always have thoughts of socks going on in the back of my mind. I just wish I had the time (and the healthy hands!!) to knit all the socks I daydream about! I am not affiliated with the company or designers mentioned in this post. I received no monetary compensation from said company or designers for my review. I was sent a digital copy of the issue for review purposes in exchange for posting the review. The opinions I've written are my own and I will not be receiving any commissions from the links provided in this post or from any of the links provided. a fantastic review!! there are some gorgeous sock patterns, and I agree that there should be some info on how to change up the sizing- or how to measure an existing sock that fits you well to give you more info on how to adjust sock patterns for a better fit. Personally, I'm obsessed with finding a good toe pocket for my short and chubby toes. Yes! I understand that there are so many issues feet can have - high arches, fallen arches, wide toe box, etc - but at least offer different circumferences if the design has a detailed stitch pattern. It took me quite a few pairs of socks to realize that I was casting on/binding off too many stitches for my pointy toes, so I can definitely relate to being obsessed with finding a great fit for the toe area!